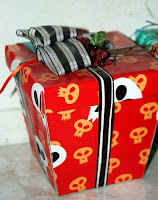 After taking a ride along Disneyland’s Holiday Haunted Mansion (when it’s all dressed up as Nightmare Before Christmas), I decided I needed Nightmare wrapping paper. Many family members are huge fans of the flick, so it would be perfect. As it turns out, you can’t just buy these great designs. I spent a stupid amount of time looking all over the net. Someone should jump on that by the way. Then it occurred to me that this can be recreated with the magic of the computer. I changed my internet searching to photos of the Holiday Haunted Mansion. Daveland Web is a good resource for photos. I gathered several megabytes of wrapping paper photos for reference. They were then replicated with Illustrator and printed on a huge plotter. The paper is thick, but it’s not wrapping paper texture. It actually makes it easier to wrap and easier to open without tearing. Recipients appreciate this. It's wrapping paper worth keeping. The strips of black and white "ribbon" on the sides of the package are also printed. The bow on the top of the picture below was made with ribbon found at Michael's. Pick up the sticks and fake berries at Michael’s or a similar craft store. They usually have something workable year round, and these specific kinds show up around October. The skulls? Those were sculpted and then cast in urethane plastic (we used Smooth-Cast 300 Series). Search the net for reference photos of the skull. You can even print them and make a template. If you are just making a couple of them, you can use polymer clay. They were given the cool look with washes of white acrylic paint. Paint the whole piece in black acrylic (I love Liquitex Basics) first. While the black paint is drying, mix a small amount of white paint with alcohol. Paint this on top of the black in thin coats, letting it dry in between. Do this slowly until you have the desired effect. 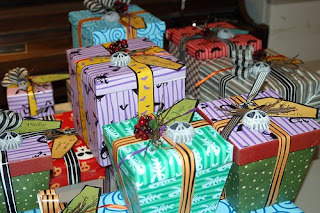 I used the magical hot glue gun to attach the adornments on the top of the packages. The family fought over who got to keep them. They are now displayed every year along with all the Nightmare and Halloweentown decorations. You can now download all of these wrapping papers in this Deviant Art gallery. You should sell this paper on etsy! You could find and also advise any video clips conveniently. Mobdro Download Mobdro live TV give you an alternative to bookmark. A pop-up message will certainly appear confirming rootexplorers flexibility apk for Android from the designer's site.